Combining cinematic talent with extraordinary culinary and wine creations, Devour! 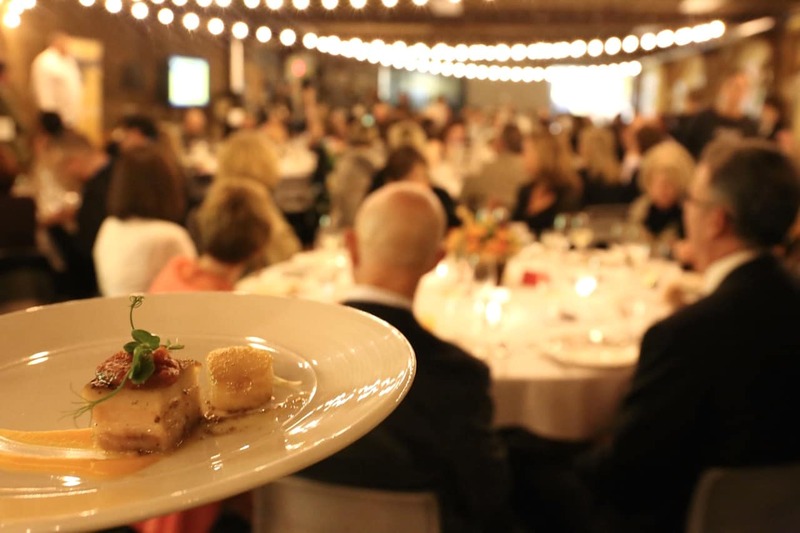 The Food Film Fest is the world’s largest festival focused on food and film. Taking place in the culinary epicenter of the province, Wolfville, Nova Scotia, the sixth edition of Devour! tantalized the tastebuds of foodies on Canada’s East Coast November 2-6, 2016. Set against the beautiful backdrop of the Annapolis Valley, the town of Wolfville and Kings County offer a charming festival setting, featuring a number of historic theatres, unique local venues and scenic beauty perfect for a rural romp. Only one hour from the city of Halifax in the heartland of Nova Scotia’s burgeoning wine industry and the centre of culinary and agricultural innovation, Wolfville is also home to Acadia University, one of Canada’s most renowned academic institutions. The sixth edition of Devour! 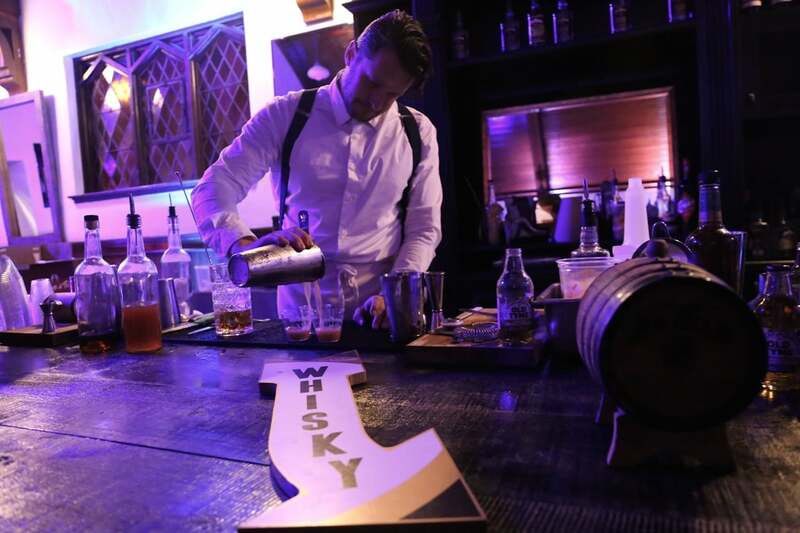 included 94 unique events over five days, including 80 films, 24 industry workshops, 20 tasting tours, three celebrity chef dinners and over 20 parties. Participating celebrity chefs include Barbara Lynch (Boston’s No 9 Park), Mary Sue Milliken (Los Angeles’ Border Grill), Christine Flynn (Toronto’s Chef Jacques La Merde), Normand Laprise (James Beard Award-winning Toqué in Montreal), Stephen Wall (Ottawa’s Supply + Demand), John Sundstrum (Seattle’s Lark) and Food Network’s John Higgins and Ned Bell. If you’re a lover of both food and film Devour! offers a unique opportunity to nerd out while exploring Canada’s East Coast culinary culture. After spending nearly a week eating and drinking myself silly in Wolfville my thoughts on the final day of Devour! sum up the experience nicely. I spent the last three nights utterly enchanted as a rotating choir of celebrity chefs produced a parade of pretty plates in celebration of films on food. Lights twinkled overhead, ice bobbed in craft cocktails, fine wine flowed freely and new friends giggled over truffle and tortellini. At the end of each feast you could hear soft groans as bloated bellies waddled home under magical moonlight. The sixth edition of Devour! kicked off in grand style with a lively Opening Gala Reception presented by Taste of Nova Scotia. 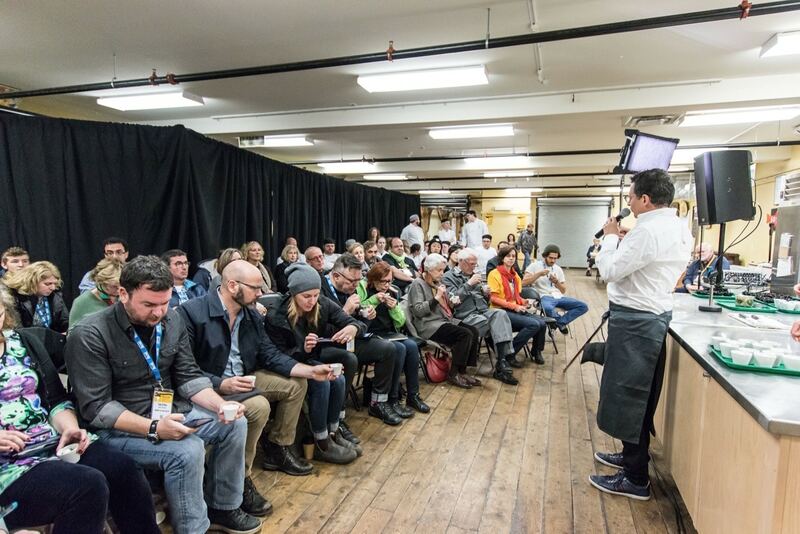 Thirteen of Nova Scotia’s finest chefs came together to create a sensory exploration that celebrated the province’s local cuisine while stellar sips were offered by award winning craft breweries, wineries and cider houses. The soiree’s guest curator was none other than San Fransisco’s Chef Dominique Crenn who could be found sipping fine wine and nibbling petite treats from Nova Scotia’s finest kitchen talent throughout the eve. Crenn has plenty of food fans, having been immortalized on Netflix’s Chef’s Table Season 2 as well as recently accepting the award as World’s Best Female Chef 2016! Just a short jaunt from downtown Wolfville, this moving tour through the history of the Acadian people began with a guided walk through the UNESCO World Heritage Site grounds of the Grand Pré National Historic Site. 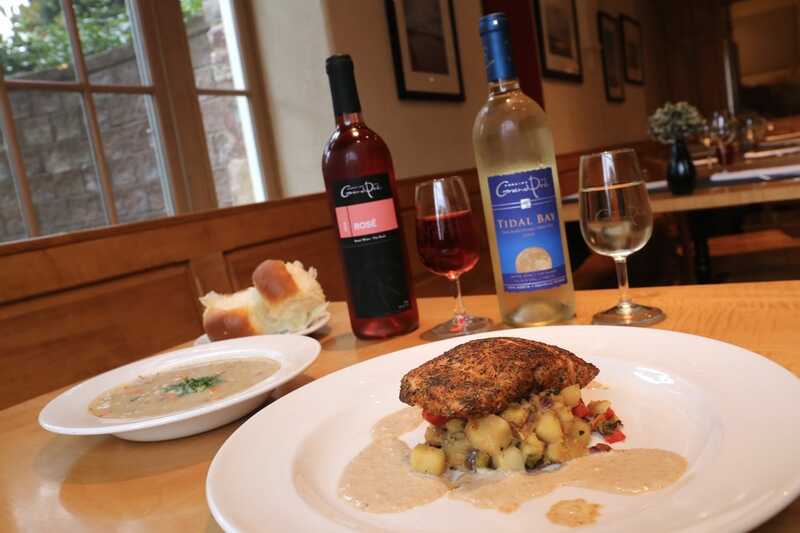 Guests were then treated to an Acadian-inspired lunch at Le Caveau Restaurant, named one of twenty of the world’s best winery restaurants by Wine Access magazine. Featuring a collaborative lunch between Chef Jason Lynch (Le Caveau and Grand Pré Winery) and Chef Shane Robilliard (Fox Harb’r Resort). The fine feast included hearty Soup of Barley with smoked brisket and napa cabbage followed by Blackened Blue Salmon with grilled zucchini, squash, yukon gold hash and chanterelle mushroom froth. The Devour! Street Food Party took place at Robie Tufts Park and included some of the regions fave food trucks and restaurant pop-ups. 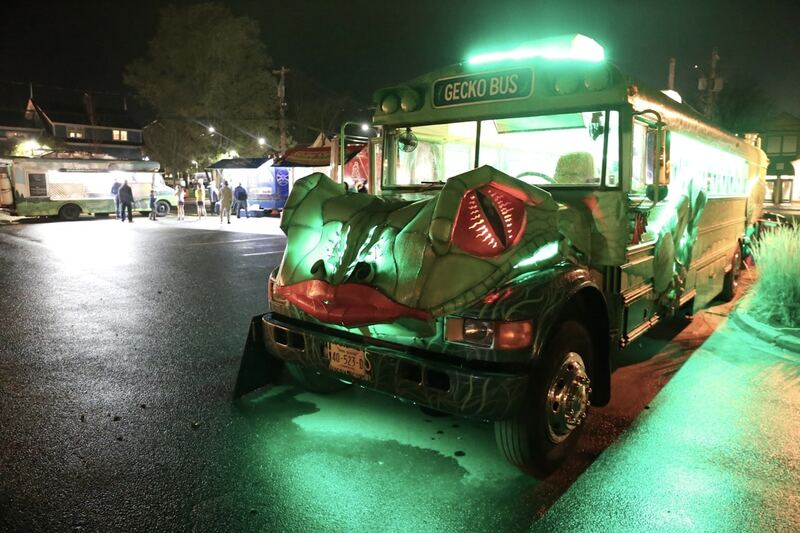 Local food fans gobbled up treats at this al fresco feast with offerings by Gecko Bus, Cheesecurds, Donair Trailer, Nomad Gourmet, T-Dogs, Carl’s Independent, Frais Catering, Tap Root Farms, Julian’s Feel Good Food, Union Street Cafe, The Noodle Guy, Le Caveau and Cake Lady. Theatre of Life tells the story of famous Italian Chef Massimo Bottura who opened a soup kitchen and invited 60 of the world’s top chefs to cook with the food waste from Milan’s 2015 World Fair to feed the city’s hungry. 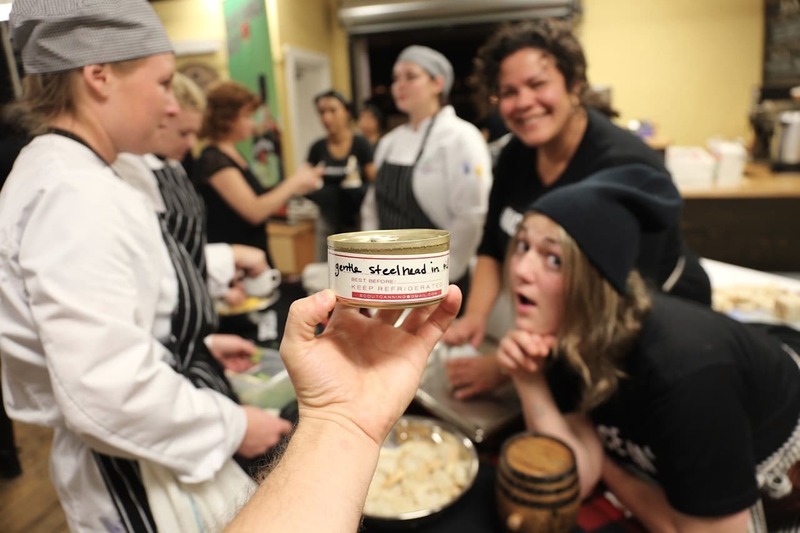 Following a gala screening of the film hungry guests strolled over to the Wolfville Farmers Market for an epic feast prepared by top chefs who crafted dishes inspired by Massimo’s waste not want not mantra. The six course dinner featured Maple Glazed Pork Belly with Digby Scallop by Ardon Mofford (Governor’s Pub & Eatery, Nova Scotia), Cold Cod Soup by Normand Laprise (Toqué, Montréal), Ale Braised Nova Scotia Lamb Shank with haggis gnocchi and pickled vegetables by John Higgins (Chopped Canada & George Brown College, Toronto) and Cheddar Cheese Ice Cream with Apple and Barley by Stephen Wall (Supply + Demand, Ottawa). Throughout the festival industry, media and VIPs rubbed shoulders between gala screenings and celebrity chef dinner’s under a big white tent. 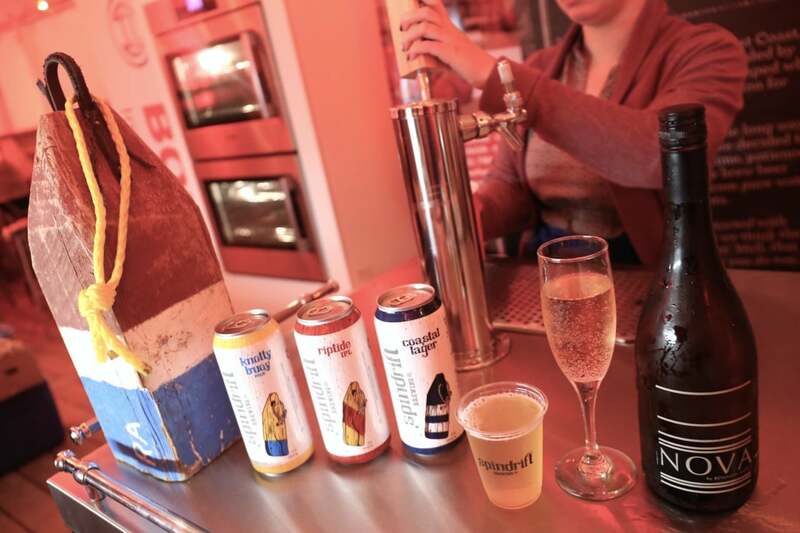 Devour’s official beer garden featured Kino Bier from Spindrift Brewing and fine wine courtesy of Benjamin Bridge. 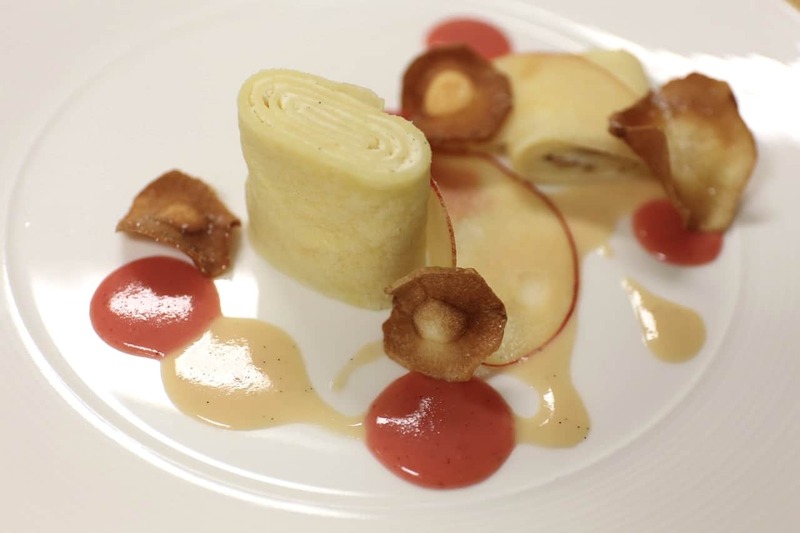 Exploring food waste and maximizing use of products has always been at the core of the Toqué! philosophy. At the Wolfville Farmers Market Chef Laprise showed an eager audience how to use as much of an Atlantic Cod as possible and at the same time produce a sample of Sophie’s Cold Cod Soup, a Toqué! signature dish. What is the importance of culinary tourism to a region? How does it bring both economic prosperity and pride in community and how can we innovate? Guests at the Culinary Tourism Summit listened in as six experts shared their ideas for innovation from coast-to-coast. The panel was made up of operators and those working in government and the non-profit space featuring Allison Kouzovnikov (President of Shorefast Foundation), Arlene Stein (Founder of Terroir Symposium), Rebecca Mackenzie (Executive Director of the Culinary Tourism Alliance), Ingrid Jarrett (General Manager of Watermark Resort), Kelley Glazer (Executive Director of Destination Osoyoos), Jocelyn Lightfoot (Co-Owner, Lightfoot & Wolfville Winery) and Mary Tulle (Destination Cape Breton). Sour Grapes is a thriller of a documentary which puts a spotlight on the fine and rare wine auction market centering around a counterfeiter who befriended the rich and powerful and sold millions of dollars of fraudulent wine through the top auction houses. 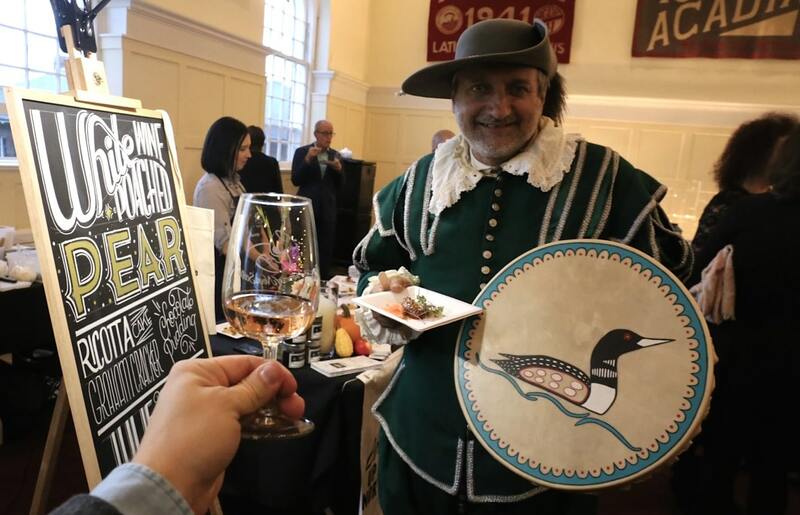 Following a gala screening of the film hungry guests strolled over to the Wolfville Farmers Market for an epic feast prepared by top chefs who crafted dishes inspired by fine wine and fraud (plenty of shifty business on each plate). The five course dinner featured Bacon Wrapped Scallop by Mark Gray (Battery Park & Brooklyn Warehouse, Halifax), Organic Beet Root and Kale by Andru Branch (Dartmouth North Community Food Centre), Duck Breast with smoked quince, rye berries and foie gras emulsion by John Sundstrom (Lark, Seattle), Counterfeit Squid with sour sausage, banana blossom salad, hana and black rice by Ray Bear (Studio East Food + Drink, Halifax) and Apple Crepe with compressed local apples and parsnip cream by Dale MacKay (Ayden Kitchen & Bar, Saskatoon). For the fourth year running talented Devour! mixologists, Matt Jones and Jeff Van Horne served a parade of craft cocktails to eager dance fans. Resident DJ Simon Thibault played a mix of tunes both old and new at The Church of Devour! into the wee hours of the morning. West Palm Beach, Florida is home to Clay Carnes’ red-hot Cholo Soy Taqueria. The winner of Food Network USA’s Cutthroat Kitchen Time Warp Tournament demonstrated how you can prepare handmade yellow corn tortillas using equipment in your kitchen, made some quick pickles and sauces to top his tortillas and used local inspiration with Nova Scotia products such as a fresh local goat cheese. Gluten lovers enjoyed an intimate session on the ins and outs of sourdough from the Halifax-based bread maven Chef Laura MacLeod. 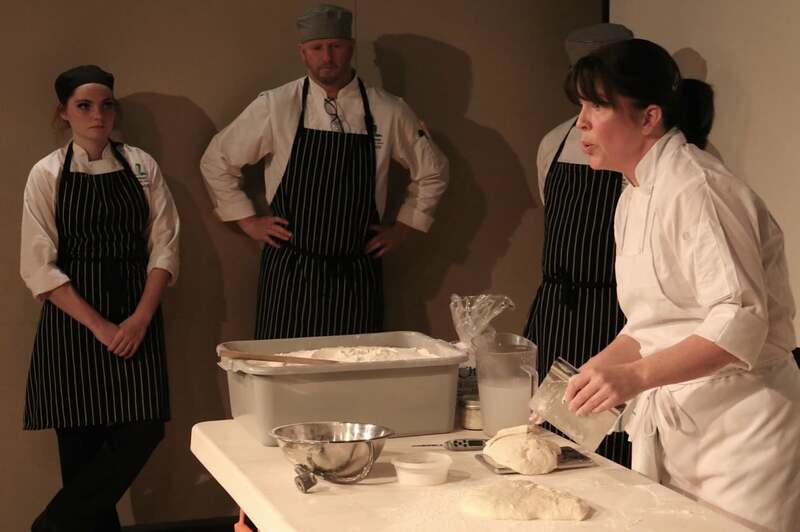 The audience walked through each step of the bread making process, learning about baking a classic Euro-style sourdough, the difference between a Euro-style and San Francisco-style sourdough, starters, gluten, mixing, fermentation, proofing, scoring and baking. 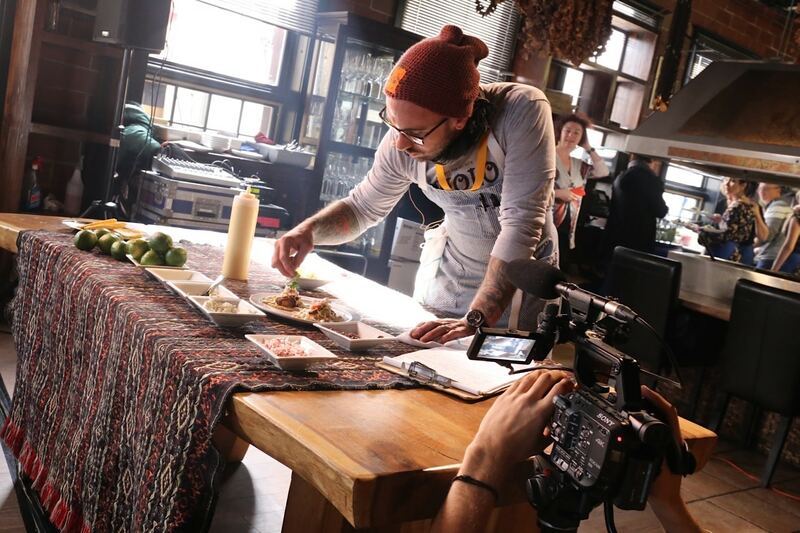 John Henion produced the highly acclaimed Netflix Original documentary series, Chefs Table, which profiles the art and craft of some of the world’s most innovative chefs. Fans of the show joined Devour! Jury member Steve Chagollan who moderated a lively discussion, exploring how John creatively tells food stories through the medium of television – its challenges and triumphs. Apparently it was a struggle to get chefs to sign on to the first season as they had no clue what the product was going to look like. 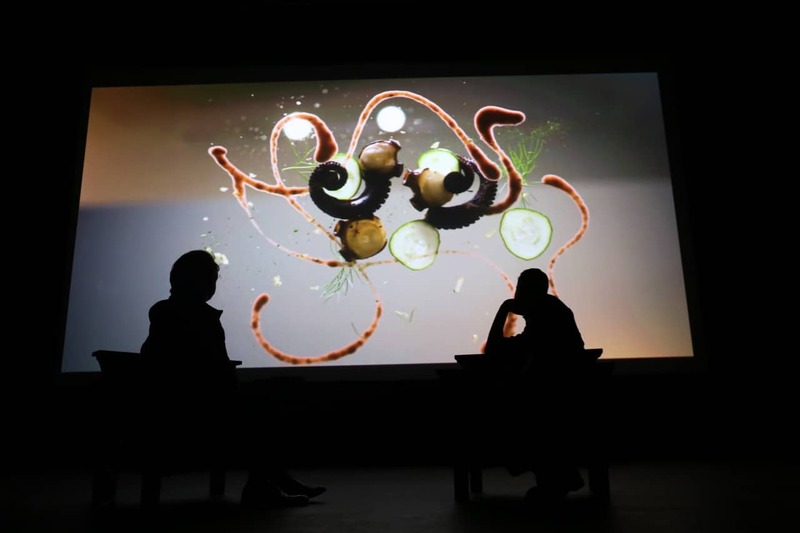 Once the first iteration of Chefs Table became a sensation the production team was constantly receiving calls from 3 Michelin star chefs eager to be featured on the next season (what great PR!). He mentioned that all of the chefs on the show have a deeply personal relationship with their food and likened opening up their kitchens to his TV crew (and the world) to sharing a picture of themselves naked with a stranger. In The Goddesses of Food French filmmaker Vérane Frediani circumnavigates the globe to tell the story of the world of women and cuisine. Featuring some of the greats such as Chef Dominique Crenn and Chef Barbara Lynch, to those at the very start of their careers, to those making incredible food in the farthest reaches of the world – the many successes and challenges that face women in the kitchen are revealed. 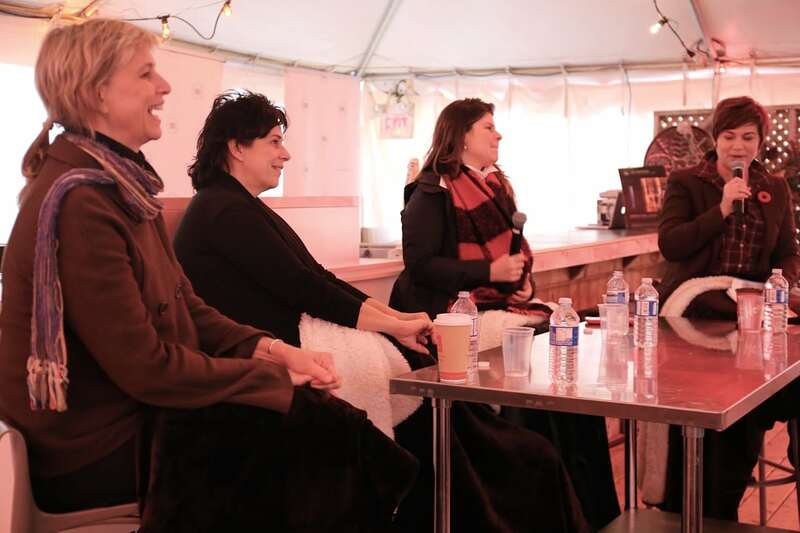 Following a gala screening of the film hungry guests strolled over to the Wolfville Farmers Market for an epic feast prepared by a choir of top chefs who crafted dishes inspired by their own feminine mystique. The seven course dinner featured Cured Steelhead Trout with cold pressed canola oil garlic and lemon by Charlotte Langley (Scout Canning, Toronto), Composed salad with beets, fennel, radish, arugula, labneh, everything bagel spices + crispy salmon skin by Christine Flynn (iQ Food Co, Toronto), Rosemary and Local Grape Focaccia with blue cheese shortbread crackers and gougeres by Laura MacLeod (The Old Apothecary, Halifax), Lobster and Snow Crab Salad with avocado and citrus aioli by Bee Choo Char (Prince George Hotel, Halifax), White Bean Boullion with mascarpone ravioli, hazelnuts, and white truffle by Barbara Lynch (Barbara Lynch Gruppo, Boston), Braised NS Beef Brisket with creamy farro, roasted cauliflower and crabapple mustard by Renée Lavallée (The Canteen, Dartmouth), Apple Walnut Capirotada with Crema Sorbet and Pomme d’Or caramel by Mary Sue Milliken (Border Grill Restaurants & Trucks, Los Angeles). On the final morning of the festival attendees headed to the Wolfville Farmers Market for the Golden Tines Awards Brunch. The buffet breakfast was prepared by George Brown College and Nova Scotia Community College culinary students and featured kimchi fried rice, lobster Eggs Benedict and lemon curd topped bread pudding. 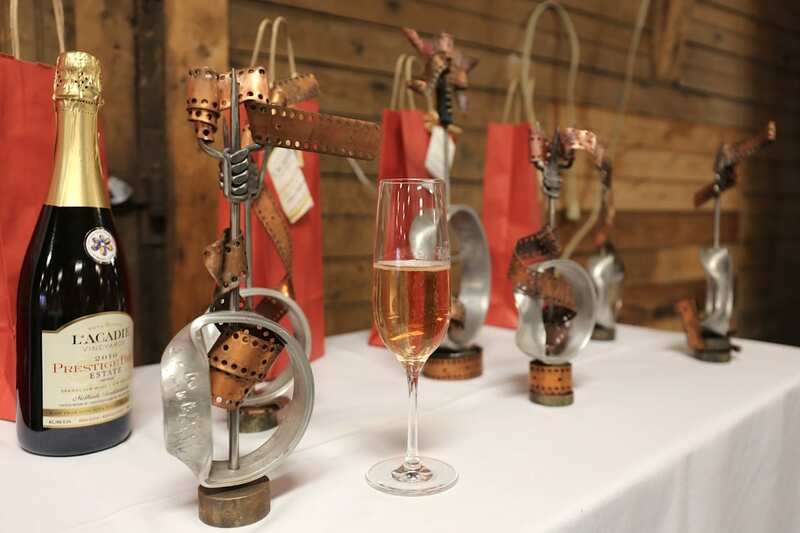 Boozy brunch cocktails and flutes of bubbly were sipped slowly as the Golden Tine Awards for the year’s films were called out to five categories – Best Short Documentary, Best Short Drama, Best Feature Documentary, Best Feature Drama and Best Animation. The films were chosen by an esteemed jury featuring Craig Weintraub, Arlene Stein and Steve Chagollan. The advances that female chefs and restaurateurs have made in a traditionally male dominated industry were applauded and celebrated as the central theme to this years Devour! But at what cost have these changes come? What do women in cuisine see as their future challenges, goals and aspirations? 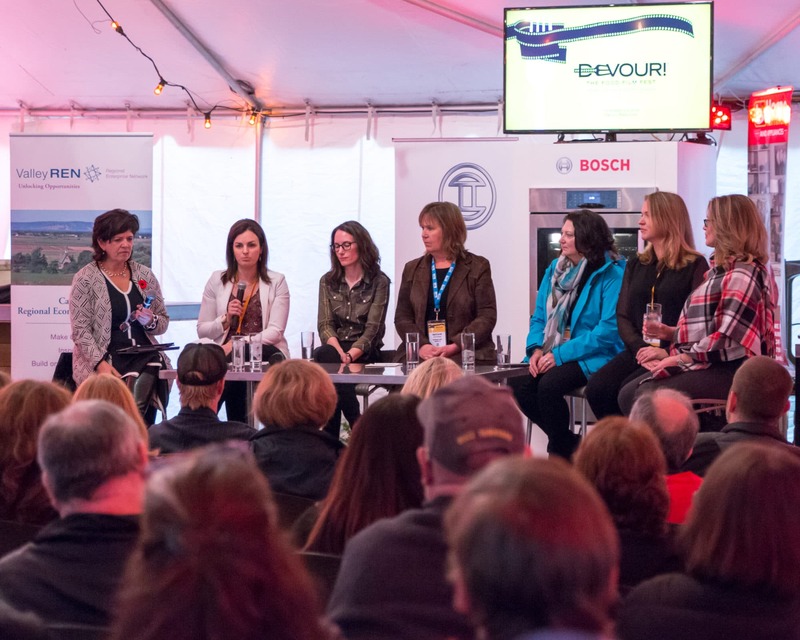 A group of internationally celebrated chefs (Barbara Lynch, Mary Sue Milliken, Christine Flynn) shared their own personal experiences in a discussion on the power of Women in Gastronomy – to inspire, grow and change the industry they love.